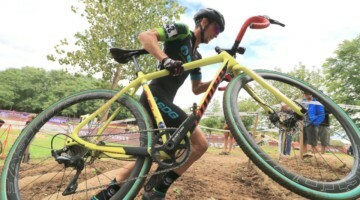 Last month, Tobin Ortenblad joked about “dad watts” helping out Jeremy Powers, but after Christel Ferrier-Bruneau’s (SAS Macogep Aquisio) third-place finish at the Pan-American Championships, mom watts are in this month. 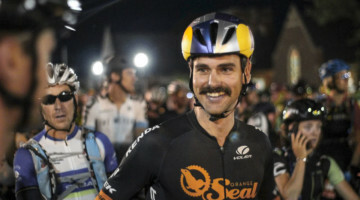 Ferrier-Bruneau, who is originally from France, retired from racing in 2013 to start a family. After giving birth to her son Alexandre and taking care of him as a young baby, Ferrier-Bruneau moved to Quebec, got her Canadian citizenship and returned to racing. In her first season of racing since 2013, Ferrier-Bruneau turned in some nice results in 2016, including a win at Nittany Lion Cross and two seconds at DCCX. This season she first turned some heads when she finished third at the Trek CX Cup Friday race. 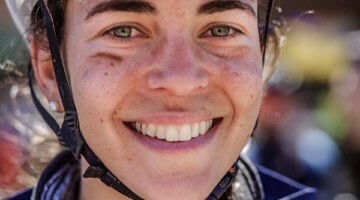 Winning the Canadian National Championship was a major goal for the newly-minted Canuck, and Ferrier-Bruneau accomplished her mission last weekend in Sherbrooke. During our post-race interview, she said it was a special accomplishment. Ferrier-Bruneau talked about the race and more in our post-race interview from Louisville. Stay tuned for our continuing coverage of the 2017 Pan-American Championships and Derby City Cup. Next post Video: Wout van Aert Teaches Youth to Respect Their "Elders"